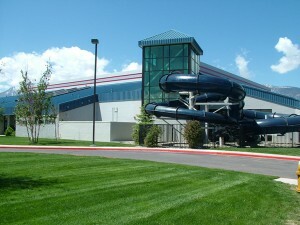 The Carson Valley Swim Center was featured in the Record-Courier on July 2016. If you would like to read the whole article you can Click Here. If you would like to know more about joining our team and becoming a lifeguard Click Here. 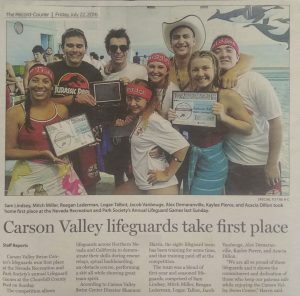 Sam Lindsey, Mitch Miller, Reagan Lederman, Logan Talbot, Jacob Vanbeuge, Alex Demaranville, Kaylee Pierce, and Acacia Dillon took home first place at the Nevada Recreation and Park Societyâs Annual Lifeguard Games last Sunday. Carson Valley Swim Center’s lifeguards won first place at the Nevada Recreation and Park Society’s annual Lifeguard Games at the Churchill County Pool on Sunday. The competition allows lifeguards across Northern Nevada and California to demonstrate their skills during rescue relays, spinal backboarding, an obstacle course, performing a skit all while showing great team spirit. According to Carson Valley Swim Center Director Shannon Harris, the eight-lifeguard team has been training for some time, and that training paid off at the competition. The team was a blend of first-year and seasoned lifeguards, comprised of Sam Lindsey, Mitch Miller, Reagan Lederman, Logan Talbot, Jacob Vanbeuge, Alex Demaranville, Kaylee Pierce, and Acacia Dillon. “We are all so proud of these lifeguards and it shows the commitment and dedication of those who keep our patrons safe while enjoying the Carson Valley Swim Center,” Harris said.